U.S. Biathlon Team Shines After Refocusing After a disappointing finish in the 2006 games, the U.S. Olympic Committee boosted funding for the men's team, which helped bring in world-class coaches and technicians. Now the biathletes — who cross-country ski and shoot a rifle at a target — come to the Vancouver Games with newfound international respect. American biathletes have come to the Winter Olympics with newfound international respect, and they're determined to bring biathlon out of the shadows in the U.S. The athletes, who cross-country ski and shoot a rifle at a target, are back in action Tuesday at Whistler Olympic Park. U.S. biathlete Jay Hakkinen adjusts his rifle after a training session at the Olympic Games in Whistler, British Columbia. There was a discussion four years ago — actually, it was more like a dressing down — and Jay Hakkinen remembers it well. The veteran U.S. biathlete had just finished ninth with his teammates in a biathlon relay at the 2006 Olympics in Italy. They had led the race early on but couldn't hang on for the victory, and Hakkinen wasn't happy. Afterward, he had the "discussion" with a few members of the U.S. Olympic Committee. "You see what the potential of this team was," Hakkinen recalls telling them, "and you didn't give us the support to do that, to get that medal. You didn't believe in us, and that's why we didn't get the medal." The USOC got the message from Hakkinen and others tied to the biathlon program: More money equals success. Going into the 2006 games in Italy, the USOC gave biathlon $250,000 a year. After Italy, funding tripled. This season, biathlon got $1 million — money that brought in world-class coaches and technicians. Late last week at the biathlon practice range at Whistler, Tim Burke steadied his rifle, pulled the trigger and hit the target — again and again. Burke, 28, is the most visible return on the USOC's investment. This past year was his — and, by extension, U.S. biathlon's — breakout season. In December, Burke became the first American to be ranked No. 1 in World Cup standings. Currently his world ranking is No. 5. "I think it's years of hard work coming together," Burke says. If there is one particular reason for his success, Burke says, it's his shooting, which is much more consistent this year. That's due in large part to Armin Auchentaller, a world-class shooting coach hired away from the Italian national team with some of that USOC money. 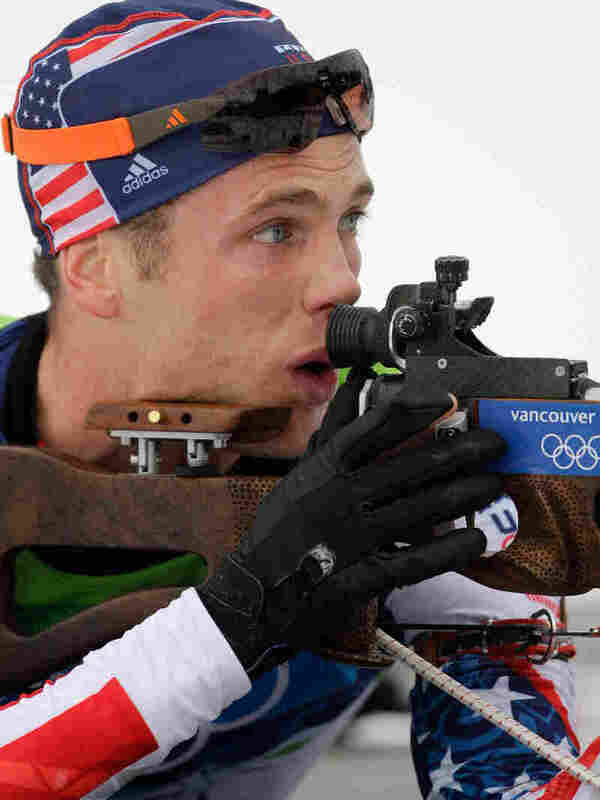 Burke says Auchentaller has helped with the all-important transition moments in a race — when the athlete skis up to the range, takes the rifle off his back, shoots and then skis off again. "Basically, he choreographed the movements I'm doing there and made everything much smoother," Burke says. "I'm saving a second or two every time I come in to shoot." Auchentaller had Burke practice the movement constantly, not just at the range. "In my apartment, at night, hundreds of times," Burke says, "with the lights off, my eyes closed — so it totally becomes something that's second nature for me." Apartment practice is just part of the work regimen installed by biathlon head coach Per Nilsson. He was hired in 2006, and in a quiet, Swedish kind of way, Nilsson applied a figurative cattle prod to the U.S. team. "I think if he could get away with it," Hakkinen says of Nilsson, "our training would be digging ditches until we hit China! I mean, he's a traditional Swedish worker." Nilsson figures the workload he imposed is about double what the team was doing when he arrived. He calls the low level of training when he started with the U.S. "surprising." Despite America's low status in the biathlon world, Nilsson saw potential. "It was like a white picture," he says. "You can paint, and they have followed the guidelines, and that's great to see." The Vancouver games were to be the unveiling of Nilsson's painted picture. 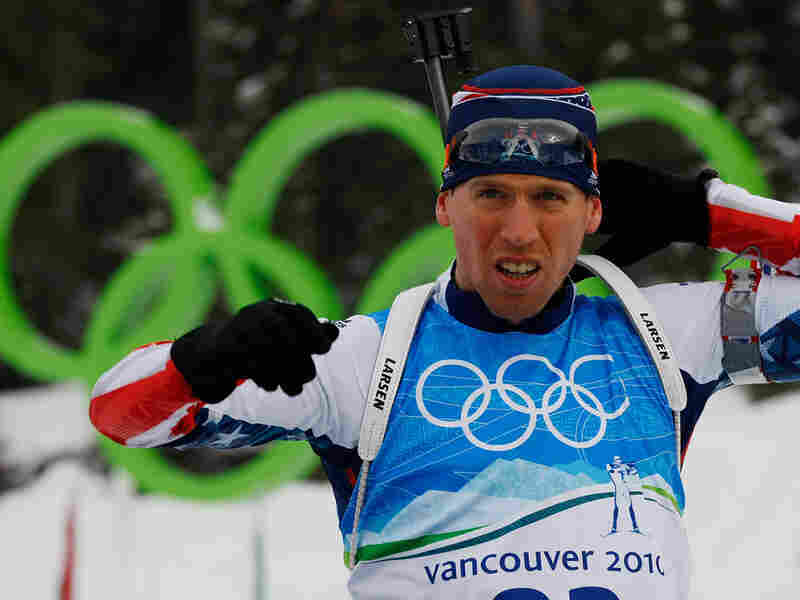 In the first men's biathlon event of the Olympics, a 10-kilometer sprint, Jeremy Teela finished ninth. That's the best Olympic result ever for the U.S. team. But Burke and a number of competitors got caught in a sudden snow squall that hurt their ski times. Burke, who finished 47th, called it "the most unfair race I've ever been part of." The bad news: Positions in Tuesday's 12.5-kilometer pursuit are determined by the sprint results. The good news: There are more events after Tuesday. That means more chances for U.S. biathletes to have a medal-winning moment, and to remind the Nordic sports world that they belong.